We still haven’t passed the Valentine’s Day marker, but unseasonable warmth has spurred on plant growth faster than usual. Daffodils, witch hazel, Daphne, snow drops, plum trees, Indian plum, red maples, sweet box, and Crocus are all blooming and creating clouds of fragrance that waft around the neighborhoods. Ahh. And to sweeten an already sweet season, we have a spring chicken in our family, a baby girl, who is just beginning to look around and enjoy the outside world. Such fun. With Spring comes clean-up and planning time in the garden. Contact us with any design or site planning questions, or to get set up with a design consultation package. Look under our Services and Our Work tabs to see some of our past projects. Remember, plant your peas on President’s Day! Potatoes go in on St. Patrick’s Day. 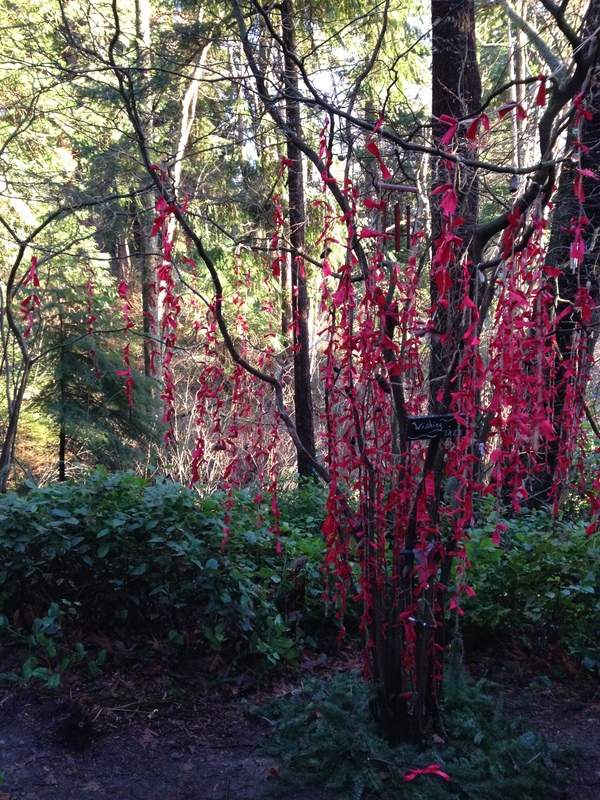 Here is a new kind of tree in bloom that we found in Carkeek Park: a Wishing Tree! Full of red ribbons with people’s wishes written and tied on.